How many ways can you make potatoes? Baked, mashed, roasted, boiled, twice baked, and on and on and on. How about smashed potatoes? This is one of my most favorite side dishes and so easy to make. These smashed potatoes take on a crispier outside and soft inside. My fave! These measurements for this recipe are more like guidelines. I tend to like my food a little saltier than my husband, so I use almost 3 teaspoons of the Kosher salt. But you can cater this to what your family likes. I have left out the pepper completely when I know I will be serving this dish to little kids. In a large pot, bring water to boil. Add potatoes and two pinches of salt and boil for about 20 minutes, or until a fork inserted into potato feels tender. On a jelly roll pan, drizzle some olive oil so potatoes do not stick to pan. Place potatoes on jelly roll pan and arrange like you would cookies. Then, using a potato masher, smash the potatoes then turn the masher 90 degrees amd smash again. 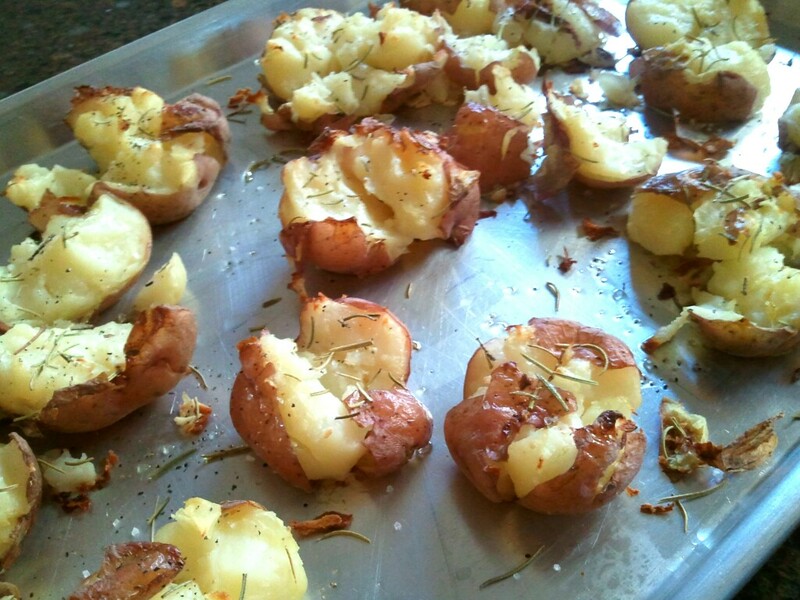 (I find this takes a delicate touch) Then brush or drizzle more olive oil over the tops of the potatoes. Then sprinkle the salt on the potatoes. Lastly, sprinkle rosemary on. Remember that if you are using dried rosemary, to use less than if you are using fresh. Place in a 450 degree preheated oven and bake for 15-20 minutes, or until tops start to golden. Serve immediately!